A digital media campaign highlighting the life of black students at Harvard has drawn tens of thousands of views on Tumblr and other outlets. I, Too, Am Harvard is "a photo campaign highlighting the faces and voices of black students at Harvard College," according to the Tumblr page where the pictures are published. "Our voices often go unheard on this campus, our experiences are devalued, our presence is questioned— this project is our way of speaking back, of claiming this campus, of standing up to say: We are here. This place is ours. 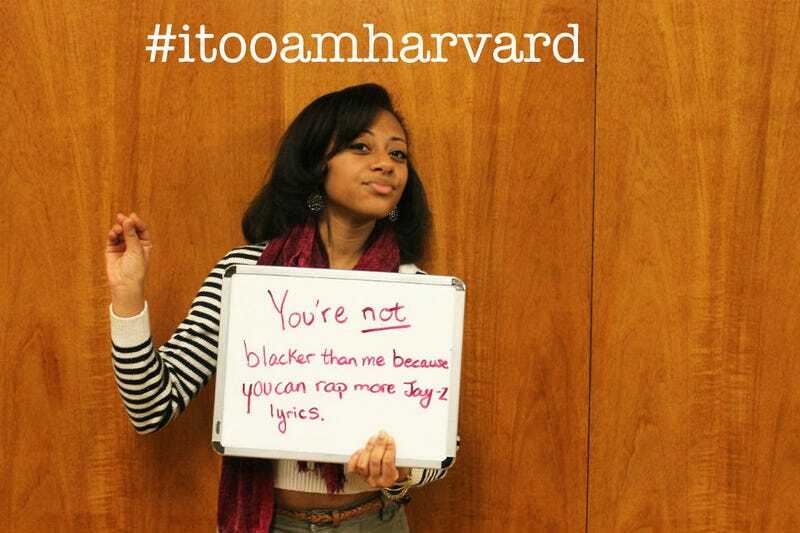 We, TOO, are Harvard"
The images are part of a multimedia project reflecting the experiences of dozens of black students called "I, Too, Am Harvard.'' It has spread quickly across social media, laying bare the racial tensions on campus and raising questions about inclusiveness, identity, and racial stereotyping. "People tell us we don't deserve to be here," remarks one student in a video produced for the project, addressing how some students feel about affirmative action and the Harvard admissions process. Another student observes that whenever the subject of race or slavery comes up in classroom discussions, all turn to see how she, a young black woman, will react. Images via I Too Am Harvard Tumblr.